Food is an important part of any wedding. The wedding reception is usually the part after the ceremony where the couple can share a meal with their guests. Different people choose different ways of celebrating the reception, but good food is something that should always be present. Choosing a good wedding caterer is therefore important to have an enjoyable and memorable reception. 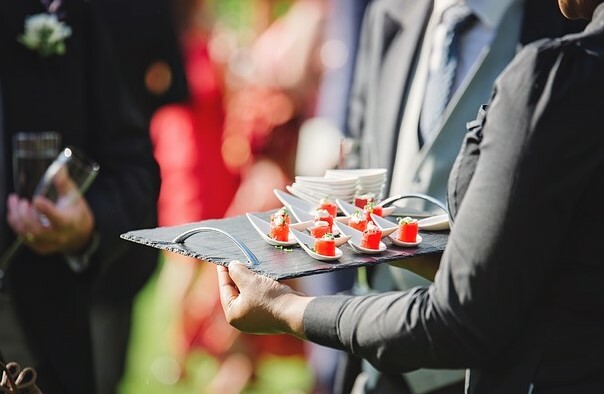 Here are some tips in choosing a caterer. 1. If the couple, or at least one of them, has specific requests for the preparation of food (e.g. because of religious beliefs), they should make sure that the caterer can deliver exactly what they need. 2. When choosing a caterer, the couple should have a careful look at the menu. If they don’t like what’s in there, they could ask the caterer if they can customize a menu just for the wedding. However, this may cost the couple extra money. 3. Is the bride’s mom allergic to shrimp? The couple should also take into consideration the specific needs of their guests especially those who are close to them. 4. Typically a caterer offers packages for a certain set of meals. Couples should expect to pay more, though, if they request for extras such as champagne, wine or waiters and waitresses. 5. Not sure which caterer to choose? Couples can ask a married friend who may be able to refer them to a good one. Their friend may even be able to ask for a discount on this one.